As with most of the toy line, the figure itself was pretty outrageous. Playmates touted the fact that they could make unusual creations out of plastic and coat it in neon and Mondo Gecko may be one of their best offerings. 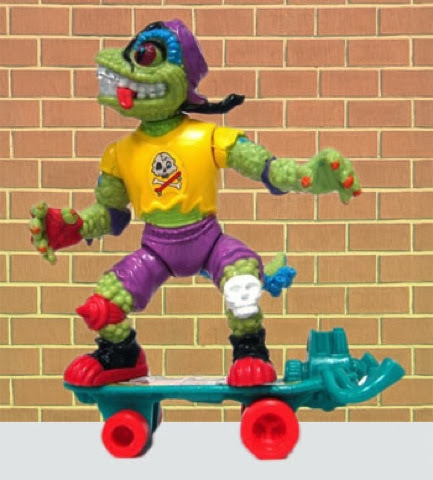 Between his "move aside, I'm a rebel" look, rad street gear and gnarly skateboard, his presentation made every 7 year old boy beg their parents for just one more figure and it sure as heck wasn't gonna be Fugitoid. No. This was one figure we all NEEDED. 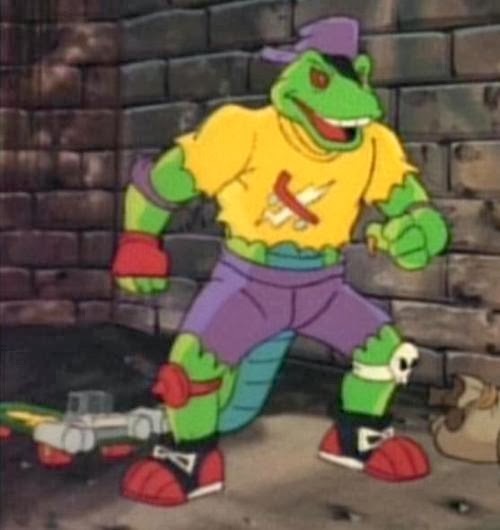 Mondo Gecko seemed to be an ally of the Turtles, and while my knowledge of his appearance of his appearance in the cartoon is fuzzy, I'd imagine he sounded like a stereotypical 80s/early 90s radical party dude/surfer who was always repeating stuff Spicolli would say to Mr. Hand. I can't figure out a good caption that would do this justice. "Rock N Roll Mondo Gecko" circa 92. Just Say No. As far as his return, I haven't kept up with the new series like I should, but I have serious doubts Mondo Gecko would return as a figure. It's a pretty solid figure, but one that was very dated. I sincerely hope I can walk into a store again and see Mondo on the shelf again, but alas, it may be just a dream. PS-There's still time to enter the Snowday Emergency Kit! Just click here and read how you can read some awesome stuff!!! Photo Credits(respectively): StrangeKidsClub, The TurtlePedia, and The Sewer Den.